Submitted by Fred on Sat, 04/29/2017 - 8:56pm. 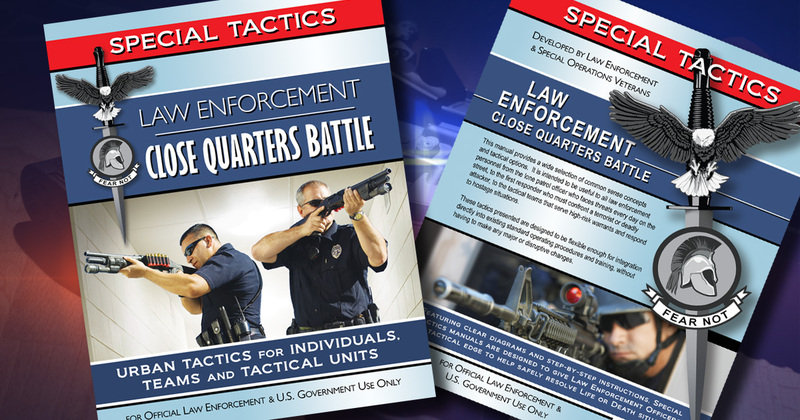 From the folks at Special Tactics who brought us the book Single Person Close Quarter Battle comes their new Law Enforcement Close Quarter Battle: Urban Tactics for Individuals, Teams and Tactical Units, developed by Law Enforcement and Special Operations Veterans. I had some time today to go through the book which is packed full of great information to include outstanding diagrams of the techniques discussed. This new manual provides a wide selection of common sense concepts and tactical options of great value to all police personnel from the lone patrol officer and first responder's handling crisis situations, to tactical teams that serve high risk warrants etc. The manual is divided into seven sections; Tactical Team Operations, Two-Person Operations, One-Person Operations, Multiple Team Operations, Special Equipment, Exterior Movement and the final chapter is Tactical Contingencies. All sections are designed to be somewhat self contained. Some officers might be interested in two-person tactics. Others might only employ delayed entry techniques. Officers should be able to read those sections only and be able to follow the text and understand the instructions without reading the entire manual. My favorite chapter, and all of the chapters are outstanding is section 6: Exterior Movement: Streets, Alleys and Windows. This is in fitting with what I have been, teaching cops about for years. I have also been writing about in The Last Hundred Yards section of my Blog. The Last Hundred Yards is metaphor for exterior movement and taking advantage of our environment when responding to calls. This helps us in shaping and reshaping the situation via the use of tactical maneuver verses the all too often used High Diddle, Diddle Straight up the Middle, the Devil Be Damned, Emotional Responses way to prevalent in policing. If officers have to move through an urban environment where threats could emerge from and building or direction, they must be prepared to move tactically in the safest way possible. Urban movement tactics are particularly useful for preparation against terrorist attacks or active shooter scenarios. In these scenarios, the adversaries might not barricade themselves in one building but will rather move freely from building to building, causing as much destruction as possible. To deal with terrorist or active shooter threats, officers must know how to move outside of building as well as inside buildings. The most critical question when moving in the street or between buildings is whether the officers are under fire or not under fire. If officers are not under fire, they can move down the street in a staggered file formation with weapons hanging or at the low ready. if officers take hostile fire, they must employ more deliberate maneuver in order to minimize exposure and address the threat. When moving under fire, officers must strive to always have one element that is moving and another element providing cover. Officers should avoid trying to move and shoot at the same time while exposed in the street without cover or concealment. instead of trying to move and shoot at the same time, officers should sprint as quickly as possible to the next covered position and then return fire from a more stable firing platform. What I also love about this manual is that it can be used as a text book or learning supplement for police academies and training schools. What is even better in my humble opinion is that the manual can be used as a guide for helping police units, and shifts refine their tactics. Its also a valuable addition to individuals officers personal library and their ongoing professional development. The book is written for tactical artisans, officers who are driven to improve their skills, who strive to continually improve in their efforts to protect and serve their communities. Without a thorough understanding of fundamental tactical principles it is impossible to tell if an operation was successful because of the tactics used or if opportune circumstances simply allowed for a favorable outcome. In fact, fortuitous circumstances are frequently mistaken for tactical acumen. In the words of one law enforcement tactical instructor we confuse good luck with good tactics. This book is designed for the thinking officer who needs to take advantage of opportunities in real-time with tactical options that make sense in the circumstances unfolding. It is not to be read in a linear way by folks looking for a single school solution. Its important for officers to remember tactics is not a thing, but a process, especially a mental process. It is a way of doing something. It is not just a certain type of attack, defense or approach, it is also WHY you chose that particular attack, defense or approach. Tactics is not just your decision as a police officer, it is how you come to your decision, your method. The goal if tactics is a unique approach to solving the tactical dilemma presented. You always want to do something different, something the adversary does not expect. You must consider the specific adversary, time and place. everything must be according to the situation because each situation is different. This book will help you prepare to do, just that! I highly recommend this book to very police officer, police trainer and police leader.